I just love the versatility of a shift dress pattern. It’s no surprise that there are a few shift dress patterns in the Style Arc range, each with their own distinctive design features. In this post I want to introduce two of our favourites, the Jodie and Martine. The shift dress has become a timeless classic. The simple styling makes the shift dress such a versatile piece. While it’s fairly plain, the shift dress can be layered over or under various garments. It can feature bold prints or be worn in a single colour for an elegant look or to highlight other accessories. We think of a shift dress as a garment with straight lines that doesn’t hug the body, especially the waist. The classic version is sleeveless and knee-length, with a high collar or boat neck line. While the shift dress has graced the catwalks throughout the decades, its style is closely linked to the mod look of the 1960’s. Audrey Hepburn, Mia Farrow, and Twiggy were some of the style icons who popularised the shift dress in that era. Closer to my home in Melbourne, Australia, Jean Shrimpton caused a stir at the 1965 Melbourne Cup when she shunned the staid look of earlier racing fashions and was photographed in a simple above-knee shift dress, shockingly without stockings and without a hat! This was the first time a such a big name had appeared at the event and shunned the conformist fashions of racing carnivals in Australia. Three shift dress icons – Jean Shrimpton, Twiggy and Jacqueline Kennedy. Away from the catwalks and silver screen, the shift dress has been employed to create a sophisticated yet elegant look since the 1960’s. When Jackie Kennedy wore a simple shift dress, women around the world wanted one too. In the early 1960’s Jackie Kennedy was largely responsible for ushering women out of the big-haired, tight-waist fashions of the 1950’s, and the simple shift dress formed the centrepiece of her iconic look. I just love the versatility of a shift dress and it’s no surprise that there are a few shift dress patterns in the Style Arc range. In this blog post I want to introduce two of our favourites, the Martine and Jodie. The Martine is an example of a simple shift dress pattern with a front ruffle feature to give it a distinctive look. I remember making accordion paper chains as a kid, and had the idea of incorporating the aesthetic in a simple shift with a front ruffle! The secret to making this garment a winner is to choose an interesting fabric with a lighter weight for the accordion trim down the front. 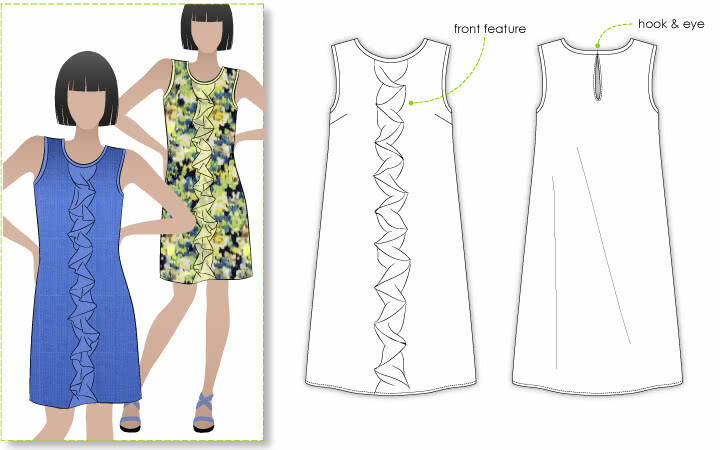 Of course, for a simpler look, this shift dress pattern can be made without the trim. Yes, it’s a little quirky, but the Jodie is a shift dress pattern straight out of the 1960’s. Back then it would have been layered over a skivvy. When dreaming up the Jodie, images of Twiggy came to mind. While this fun tunic can be worn with leggings during the cooler months or with sandals on warmer days, I think this design works best with knee high boots allowing the legs to take centre stage! To give it a look of its own, I gave the Jodie a side inset panel, and a curved hemline. Patch pockets, common in the 1960’s and once again featuring in ready-to-wear designs, finish the pattern nicely. If you like the Jodie and Martine shift dress patterns, perhaps you’d like the Kristin and Zara dresses too? Let us know what you think of the Jodie and Martine shift dresses, and don’t forget to send me some photos of your finished creations! 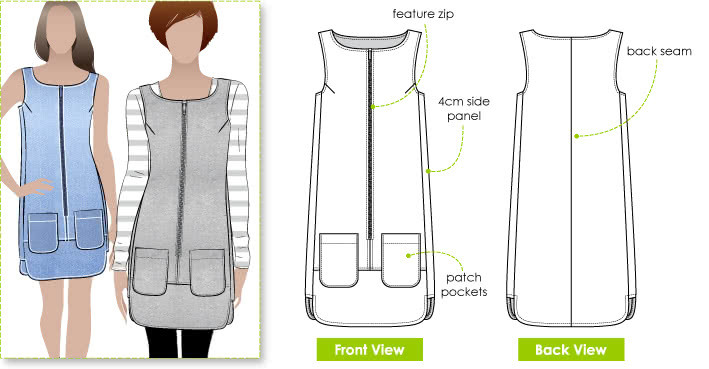 I just love seeing what you’ve created on your latest latest sewing adventures.